You might think it’s impossible for all the beauty of the Greek islands to exist in one, but it does. One of the most fascinating in the Sporades archipelago, the island of Skopelos offers lush landscapes, vineyards and pine forests, beautiful beaches, sublime panoramas, cultural and historical heritage, and the most luxurious villas, surrounded by the sweet aroma of olive groves. A Greek dream come true. The opportunity to buy a luxury villa on the island of Skopelos is as sweet as they come, and for good reason. An island of the grape, legend has it that it was founded by a son of Dionysos, the god of wine. However, the history books have written that it was eventually populated by the Cretans, who introduced viticulture to the island. After that, there was no turning back. Part of the Northern Sporades, along with the idyllic islands of Skkiáthos and Skýros, located east of the Pelion peninsula, just north of Evia, the island of Skopelos has set itself apart. It has become highly sought after not only for its wine, but also for its authenticity, its lush scenery of pine forests (which cover more than half of its territory), orchards, and mountains, and of course, its exceptional properties and idyllic beaches. If you’re in the market for a second home, buying property in Skopelos might just be for you. Whether it be a seafront villa with a spacious veranda just steps away from the Aegean, a charming townhouse in the lively Chora, or a luxury house with a swimming pool overlooking the sea, BARNES Greece helps clients find their sweet spot. Buying a villa on Skopelos opens many doors, as the island welcomes visitors to explore the history and traditional atmosphere around its capital, hilly villages, and a countryside full of ancient monasteries and prune-drying ovens. The ambiance is just as romantic as it is adventurous, with a setting nothing short of picturesque – so much so that it was the principal shooting area for the movie Mamma Mia! We can’t blame them, because it’s renowned for its ability to maintain an authentic atmosphere, thanks to the absence of an on-island airport. But this doesn’t stop crowds of tourists from indulging in one of the Mamma Mia!-themed boat tours, and that’s not all. A favorite among nature lover, both locals and guests enjoy the island’s beaches such as the sandy Agios Ioannis, which is dominated by an old chapel perched on an imposing rock off the coast, and Panormos and Milia beaches, known for its white pebbles and surrounding greenery. The island of Skopelos does well to preserve its natural environment and wildlife. In fact, it’s the prime breeding area of the monachus monachus, the Mediterranean monk seal, under the protection of the National Marine Park of Alonissos-Northern Sporades. 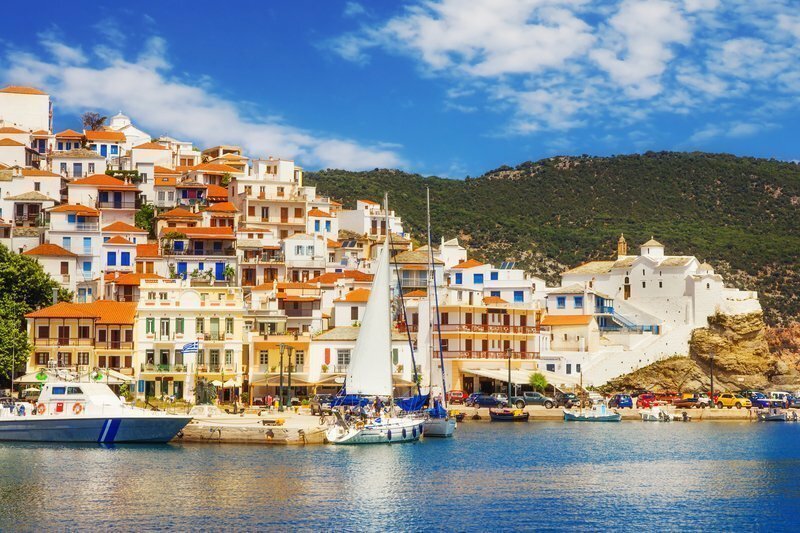 Officially, Skopelos is an extension of the Thessaly, an administrative region on the mainland, but are actually made up of the charming villages of Skopelos Town, Glossa and Elios, emblematic of unspoiled island life. In Skopelos, the stresses of modern life are out of sight, out of mind. The island has been saved from commercialization, but still offers a host of intimate tavernas serving fresh local cuisine, as well as boutiques selling regional craftwork, and of course wine, the drink of choice. Contact BARNES Greece for your real estate project in Skopelos.